In a first for UK retailers, from May 2017, all the cocoa we buy for our Co-op own brand products will be Fairtrade. It means that when you pick up a Co-op chocolate cake or a packet of biscuits you will know that the cocoa has been bought on Fairtrade terms. This is in addition to all of our own brand chocolate, which is already Fairtrade. Cocoa farmers in the developing world can decide how to invest the premiums generated through sales of Co-op’s chocolate products, themselves. They may invest in a school, in the development of their businesses, or for more immediate and vital needs such as putting food on the table. 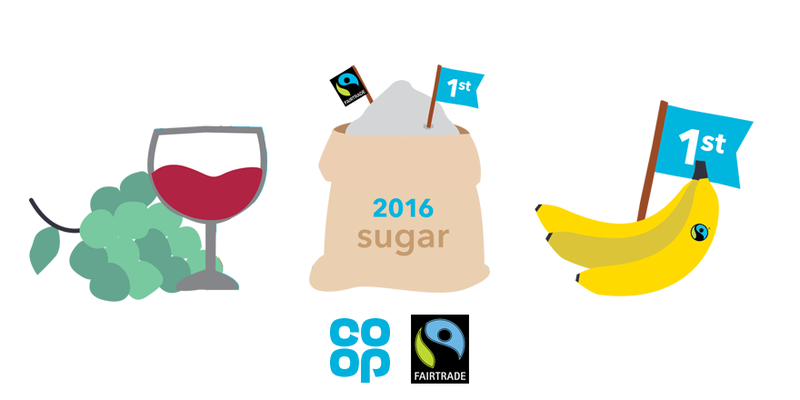 We were the first UK retailer to stock an own brand Fairtrade wine in 2001, we were the first to sell Fairtrade sugar in the UK and since 2016 all bagged sugar in Co-op is Fairtrade, in 2001 we were the first to introduce Fairtrade bananas to the UK. 15 years ago we switched our Co-op own brand chocolate bars to Fairtrade, and issued a hard-hitting report which highlighted the deep underlying issues in the cocoa industry. We proudly campaigned for an end to exploitation of cocoa farmers in the developing world. We must face up to the challenges once more. Having seen many years of positive impact and lives being changed for the good, Co-op is once again putting our weight behind championing Fairtrade. To make this commitment possible, we’ve signed up to the Fairtrade Sourcing Program. These programs were introduced by Fairtrade International to enable certified farmers to sell more of their products on Fairtrade terms. This will see a 5.4 times rise in the amount of Fairtrade cocoa sourced by Co-op, increasing the cocoa tonnage we buy from 526 to 2,848 metric tonnes, annually. 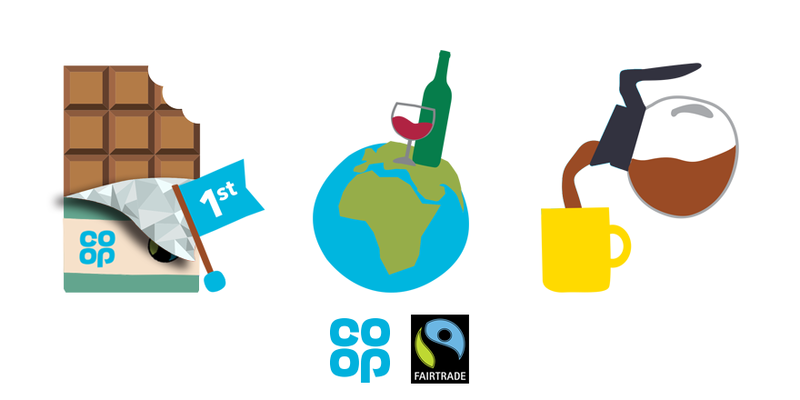 We are the only UK retailer to only sell Fairtrade own brand chocolate bars and from May 2017 all cococa in Co-op products will be Fairtrade, we’re the largest seller of Fairtrade wine in the world and we’ve been selling Fairtrade coffee since 1992, with all own brand coffee being Fairtrade since 2001. Although our commitment may be significant, the challenge still remains. Co-op is still the only retailer to offer 100% Fairtrade own brand chocolate bars and from the end of May, will be the UK’s first to source 100% of its own brand cocoa on Fairtrade terms. Whilst some major sweets brands have put a Fairtrade Mark on a product or two, Fairtrade still only represents 9.8% of the UK confectionery market and it’s not nearly enough. If other UK retailers were to pledge their support to sustainably source cocoa across their businesses, the economic impacts on cocoa farming communities could be far reaching. Even more so if they commit to sourcing their cocoa as Fairtrade. We know that Fairtrade has the ability to change lives. Our commitment offers huge support to cocoa farmers and reaffirms that there is a positive future for them, their families and communities. What is important to us is that the decision lies wholeheartedly with the farmers. Making the decision collectively and democratically as a community is the principle that lies at the heart of Fairtrade and the co-operative movement. Did this ever happen ? Fantastic news, so good to be able to buy cakes, biscuits etc in my local shop that are made with Fair trade chocolate. Well done Coop for raising the bar once again. Will any of the products contain other FT ingredients, eg sugar? Of course, this sounds very kind. Are they also organic? People working in fields that are sprayed are open to chemical poisoning! If organic, however, that is really kind and then I would fully support it! Hi there. Fairtrade does not mean a product is certified organic, but the demands of Fairtrade extend well beyond pricing and cover environmental standards too. Amongst the many requirements, the Standards prohibit the use of certain agrochemicals that are harmful to the environment and health and focus on reducing the use of pesticides. They ensure personal protective equipment is used, that farms are free from hazardous waste and are using water sustainably, and encourage activities to enhance biodiversity. The Standards also promote training for farmers, which can include advice on switching to environmentally friendly practices, such as developing nutrient-rich soils that support healthy plants and encouraging wildlife to help control pests and diseases. This has been shown to lead to good agricultural practices, which have encouraged environmentally sustainable production. Thank you for the clarification SB. Fairtrade it is! i agree with Roger Timson’s comments above; but have been of the opinion that Fairtrade produce uses little or no chemical inputs, since a conversation with Harriet Hill eleven years ago, at a launch of F/T Cotton. The reason I was given for it not being certified as organic is because of the additional costs to accreditation which small producers understandably cannot afford. Things may have changed in the intervening years with the increase in .F/T production.and the agri industry taking advantage of gullible producers. I would be interested to hear Fairtrade’s comments on the subject before I endorse the Co op’s initiative to friends and family; as tea, coffee and chocolate are all susceptible to high levels of pesticides.